Since May of 2011, the city of Ellensburg has graciously hosted a 240V/70A electric vehicle charging station. This has provided a great benefit to drivers of electric vehicles capable of charging at this high rate (so far that's only the Tesla Roadster and Tesla Model S). There are also three ChargePoint stations that charge other electric vehicles like the Nissan Leaf and Chevy Volt at their maximum charge rate. September 3, 2016 - Tom & Cathy report station is working. Send site reports to [ellensburg-hpc]. To ensure this is a sustainable ongoing operation, we need to collect funds from those who use and wish to preserve this important charging location. Since adding a billing and access control system would cost more than operating the station for several years, this means we have to fund it with donations. Any funds donated for the Ellensburg charging will be used only to pay the station's utility bills and cover any required maintenance. If at some point in the future the station is taken out of service for any reason, any remaining funds will be donated to another charging infrastructure project of interest to the Tesla community. We suggest a donation of $5 per charging session (up to two hours). This will barely cover our total utility costs, including fixed monthly fees. Sponsorship levels are listed below. 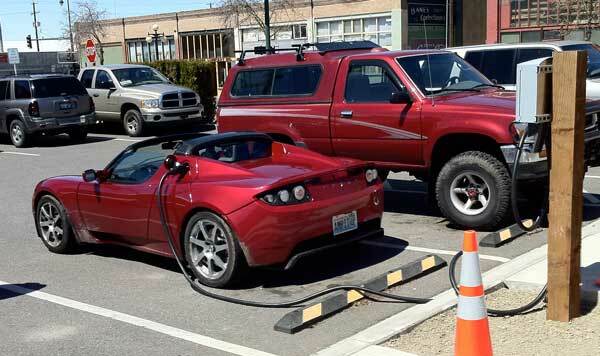 In May of 2011, with lots of help from EV supporters in Ellensburg, we (Tom & Cathy Saxton) donated a Tesla Roadster HPC to the city of Ellensburg to make it convenient to travel not only to Ellensburg but also as the link between the Puget Sound area and eastern Washington for Tesla Roadster owners. The station has served the Tesla Roadster community well with the electricity being paid for initially by the Ellensburg Lodging Tax Advisory Committee. With the introduction of the Tesla Model S, and an adapter to convert plug types, usage of the station increased dramatically. Through September of 2013, the electricity for both the station and the adjoining restrooms was generously paid for from the lodging tax. At that time, the Lodging Tax Advisory Committee decided to end their funding of the electricity for both the restrooms and the charging station.